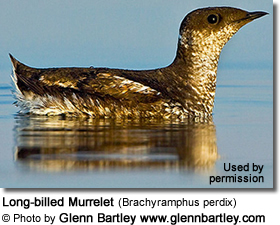 The Long-billed Murrelet (Brachyramphus perdix) is a small seabird from the North Pacific. It is an unusual member of the auk family, often nesting far inland in old growth forests. The Long-billed Murrelet, like its cousins the Marbled and Kittlitz's Murrelets, is thought to have experienced a decline in numbers recently. It closely resembles the Marbled Murrelet, of which it was considered a subspecies until 1998, when Friesen et al. showed that the mtDNA variation was greater between these two forms than between Marbled and Kittlitz's Murrelets. This species is found from Kamchatka to the Sea of Okhotsk in the western Pacific Ocean. Most birds winter in the seas around northern Japan with some reaching South Korea and southern Japan. The Marbled Murrelet, in contrast tends to remain closer to its breeding grounds. Vagrants have been reported in North America and Europe. The Long-billed Murrelet is a small (25 cm long), chunky auk with a slender black bill. It has pointed wings and plumage that varies by season. The non-breeding appearance is typically white underneath with a black crown, nape, wings and back. The breeding plumage is mainly brown, with pale feather edges giving a scaly appearance; the central underparts, normally below the surface on a swimming bird, are white. The Long-billed Murrelet is longer billed, slightly larger, and 20% heavier than the Marbled Murrelet, and has a white eye ring. In breeding plumage it shows a pale throat which is absent in Marbled Murrelet, and weaker scaling because of fewer rusty and buff markings. In winter, the Long-billed Murrelet lacks the white collar of Marbled. The Long-billed Murrelet feeds at sea principally on small fish, both in pelagic offshore areas (often associating with upwellings), and inshore in protected bays. It tends to migrate more than its closest relative the Marbled Murrelet. 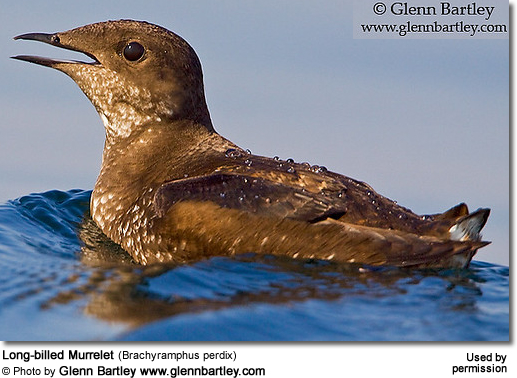 The breeding behaviour of the Long-billed Murrelet is very unusual. Unlike most other seabirds, it does not breed in colonies or even necessarily close to the sea, instead nesting in on branches of old-growth conifers(less frequently on open ground). It lays one egg on a thick lichen- or moss-covered branch or hollow. The egg is incubated for a month, then the chick is fed for around 40 days until it fledges and flies unaccompanied to the sea. Breeding success is low and chick mortality high. The Long-billed Murrelet is considered globally threatened, having declined across its range over the last few decades. The biggest threat to the murrelet is the loss of the old growth forest to logging. Other losses can occur through entanglement in fishing gear. The bird could be threatened by the oil development of the Okhotsk and Bering Sea shelves. The species is unusually prone to vagrancy, with records in both North America and Europe, often at inland sites well away from its usual ocean habitat. There are about 40 records from North America (Mlodinow 1997), half of them on the Pacific coast where they might be expected, but the rest scattered across the continent east to Florida, Pennsylvania, New Jersey, New York, Massachusetts, and Newfoundland, as well as on lakes and rivers over a thousand kilometres from the sea, in Colorado (two), Indiana (three), Montana, Ohio, and Wyoming (two). The first found in Europe was a first-winter individual discovered drowned in a fishing net at Zollikon, Lake Zurich, Switzerland on a date between 15 and 18 December 1997. The specimen has been deposited at the Naturhistorisches Museum Basel (Maumary and Knaus 2000). Europe's second was found at Dawlish Warren, Devon, England on 7 November 2006; initially identified as a Little Auk, its true identity came to light when photographs were posted to the BirdForum.net website. It was re-found offshore from Dawlish town centre on 11 November, and attracted large crowds of birdwatchers. The bird was present until 14 November, with an estimated 1000+ birders travelled from as far afield as Edinburgh and (reportedly) Holland to see it , . The third Western Palearctic record followed quickly with a bird on a reservoir in Romania, on the Olt River near Alsoporumbak from 21-23 December 2006. BirdLife International (2005). Brachyramphus perdix. 2006. IUCN Red List of Threatened Species. IUCN 2006. Retrieved on 8 May 2006. Database entry includes justification for why this species is near threatened. Friesen, V. L., Piatt, J. F., and Baker, A. J. (1996). Evidence from allozymes and cytochrome b sequences for a new species of alcid: the Long-billed Murrelet. Condor 98: 681-690. Maumary, L. and Knaus, P. (2000). Marbled Murrelet in Switzerland: a Pacific Ocean auk new to the Western Palearctic British Birds 93: 190-199 (this article on Europe's first Long-billed Murrelet was published when the species was still regarded as conspecific with Marbled Murrelet; the latter species has not occurred in Europe). Mlodinow, S. G. (1997). The Long-billed Murrelet in North America. Birding 1997 (12): 460-475. Available online (pdf file).